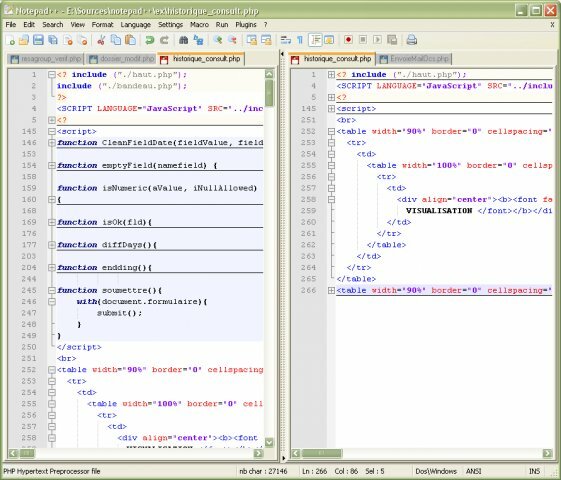 Notepad++ is a free source editor with the syntax highlighting and syntax folding. It also gives the extra functionality to define a user's own language for the syntax folding and syntax highlighting. You can print your source code in color. It allows a user to edit the different document in the same time, and even to edit the same document synchronizely in 2 different views. It supports full drag and drop. A decent editor when you consider what you are paying for it. It has most of the functions the average user will need for quick & dirty editing work. For more features consider some of the shareware/commercial offerings. You can't get much better for free. It is good to see a 64-bit version of this editor come out without having to build my own (messy). Max file size has always been a hard NP++ limitation. File size is really the only beef I have had with this editor. Now it is perfect for a free editor. The release 6.8.9 has been removed from the website because it failed the regression test. But it's a very good Editor. This program is very good but it can't handle extremely large files. Gave it it a 5 stars rating just because of the version number and the date it's out as in Friday the 13th. :-P Also did a screen capture! 2 stars less for not fixing "stylerTheme" path in "config" file to be portable even though I told the author about it ages ago. Still the best text editor on Windows. 1. 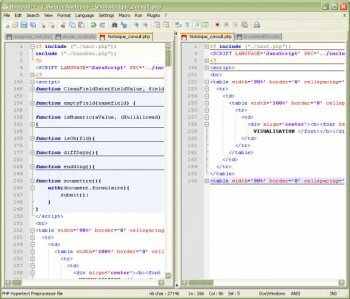 Fix Notepad++ hanging issue while saving a large file if session snapshot feature is on. 1. Add session snapshot and periodic backup feature. 2. Fix RTL/LTR command making mirrored text bug. 3. Make auto-detect character encoding optional. 4. Apply DPI-aware on find & replace dialog tab and User define language dialog tab. 5. Add shell script parser for the function list. 6. Make backslash as an escape character optional in SQL. Bottom Line: A decent editor when you consider what you are paying for it. It has most of the functions the average user will need for quick & dirty editing work. Version 6.4.5 is already out. Still pretty much my favourite full-featured text editor, although I tend to agree with the previous reviewer that Notepad2 (I prefer xhmikosr's version though - code folding etc - http://xhmikosr.github.io/notepad2-mod/) is a more lightweight and efficient choice for editing things like ini and small txt files. 1. Fix a crash issue while using Function list. 2. Enhance delimiter selection (Ctrl + Mouse Double Click) - add GUI settings in Preferences dialog. 3. Add open session in the new instance capacity. 4. Add new command line argument "-openSession" for opening a session file. 6. Fix regression -systemtray command line option not working properly. 7. Fix begin/end selection bug after the text modification between the begin and end position. 8. Add localization command line option -LlangCode where langCode is browser language code. Notepad++ 6.2.3 - End of World Edition LOL famous last words!